For part 2, see here. This is the cliché introduction which members of Alcoholics Anonymous use when greeting new inductees. While I am not trying to make light of alcoholism, I am trying to use this as a way to start a conversation about another issue… adjuncts. Being a part-timer, adjunct, contingent faculty member, instructor… whatever nomenclature you want to employ here, the truth is being an adjunct is not something to brag about these days. Why? An adjunct is a part-time knowledge worker who teaches 76% of all college courses in the US. We are contract workers (picking up jobs by the semester or year), transient populations (going where the jobs are), we rarely get benefits, are rarely hired in full-time capacity (because this would require we receive benefits), and we often don’t know if we will have work from semester to semester. Many of us have PhDs; some of us, like myself, only have a MA degree. Many of us have written for esteemed journals, published alongside tenured professors, and even written our own books. Recently the academic world has been all aflutter about us. We are the adjunct problem. And yet most of our students, their parents, and the general public, have no idea who or what an adjunct is? Nor are they aware that a large majority of their teachers are faced with a very precarious financial situation. See, as universities and colleges begin to resemble large corporations, the issue of labor becomes especially pertinent. The equation comes down to a question of supply and demand. Institutions of higher education compete for consumers, undergraduate and graduate students seeking degrees so they can increase their earning potential. The state institutions also receive tax payer money but this money has substantially dwindled over the last few years. The good news for adjuncts is that demand for college degrees is up and that means that these schools will need more teachers to accommodate this rise in demand. The bad news is that although there is more demand, the more students go to college, the more students enter the job market or compete for spots in graduate schools. This means there is a lot more competition for the jobs that are out there. Add to the equation that the recent economic crisis resulted in professors who would have normally retired at 65 or 70 keeping their positions as long as they can due to decreased funds. So this equals out to higher demand for college teachers but also a higher number of individuals competing to supply that demand. But college tuition is going up, so where is all that money going? Well, to be fair, colleges employ a ton people but there has been a significant rise in the number of college administrators and a rise in their salaries as well. In the south, university college football coaches make millions. However, they also contribute to the prestige of the school, their success lures students. So, alas, students are not lining up to come to my school because of our stellar humanities departments… shocking, I know. So money is going to entice students, to administration, and money also goes to research. So what is the cost of not paying your teachers? Since many large state institutions focus their energy on research, a bulk of the teaching of undergraduates is done by graduate students and adjuncts. Adjuncts primarily teach your introductory courses or core courses which all students are required to take before they graduate. You know, that Introduction to Economics course that you would have rather gouged your eyes out than sit through. Contrary to popular belief, these introductory courses are the most difficult to teach because they usually are made to accommodate large class sizes, teach to a wide student demographic (your egg head pre-med majors as well as the less academically inclined), and cover vast amounts of material (like Introduction to World Religions and US History from the pilgrims to the Civil War). It may come as a shock to you but most scholars are not known for being especially communicative (the irony) nor particularly sociable and often have acquired their professorships by spending years studying and continually publishing articles and books on a very small niche of their subject area. They are more like medical specialists than general physicians. They know more about one (maybe seemingly insignificant) event, idea, or practice than you could ever possible wish to know. But when asked to teach an introductory level course over the history and methods of their field to a large stadium classroom full of 18-22 year olds who are checking their text messages every 3 minutes, it is like you have asked them to invent a time machine. Actually, many professors would be more than happy to research the space-time continuum then engage the masses of undergraduate students at their gates. So as many professors (not all) try to get out of teaching these ‘barn’ courses and the administration will often oblige. Those who do agree to teach these courses are often ill-equipped to do so and end up teaching their general course (say, Introduction to Philosophy) as if it was over the early writings of Wittgenstein or Continental Rationalism (or whatever their scholarly niche is). Those professors who try to do right by their students face a large learning curve and are rightfully daunted by the amount of material they are to cover. These are brilliant scholars who have never had to say that they didn’t know the answer to a question posed to them… until now. Young professors who are relatively new to teaching also face the ‘publish or perish’ environment as they attempt to get tenure. The bar for tenure is high (service, scholarship, teaching, your first born child… just kidding… no, not really). If a young scholar isn’t offered tenure and is passed over, it is considered a ‘black mark’ on their academic reputation. With your job on the line, looming debt from graduate school hanging over your head, not knowing if you will have to move to another state or across the world to find a job next year, knowing that you have to make it into an respectable journal or write a groundbreaking book within a short window of time to keep your position and be considered for tenure… getting top scores on your student evaluations might be far from your mind. But good teaching evaluations are becoming more of a requirement for keeping a job. I cannot tell you how many times I have been contacted over the years by young professors asking for resources and guidance for teaching these large, unruly introductory courses. I am happy to help them for a few reasons… 1) they need help 2) I have spent 10 years collecting teaching materials and best practices 3) they rarely have the experience (having taught or acted as a TA for maybe one or two courses in their PhD work) and 4) it will be a horrible semester for not just that professor but also their students. Now, I am not the patron saint of young teachers, but I can’t turn away professors that care enough about teaching that they are willing ask for help or insight from the lowly adjunct. If some young professor can’t be convinced to teach these courses, often an adjunct is brought in. A lot of these introductory courses fall to the adjuncts. And, I am not complaining! I actually like the challenge of trying to get students to think about the world as they never thought about it before. There is something about watching a student when what you have been teaching finally falls into place. There is great satisfaction found in teaching college students. However, the financial benefits leave much to be desired. As an adjunct instructor of religion, my professional responsibilities and privileges often differ from my tenure-track or already tenured colleagues as well as graduate students, many of whom are just embarking on the advanced study of religion. While many positions in academia prioritize research and publishing, my position not only allows me but requires me to dedicate much of my energy and time to teaching. At maximum capacity, I have taught four Introduction to World Religions courses which consisted of anywhere from 40 to 120 students per class each semester. There were a few semesters where I taught over 300 students. Reflecting on the gravity of the fact that my course might be the only encounter these students had with the academic study of religion in their college careers, I began to see that making these courses critically challenging as well as entertaining, was not just my job but also my social responsibility, a sort of vocation. Over these ten years of teaching, I have come to see my job on the ‘frontlines’ of education about religions and discourses on the category of “religion” as vital to not only meeting the seat requirements of my department but also assisting in the construction of an educated and engaged citizenry. Having taught well over a thousand college students in my tenure as an instructor of religion at the University of Georgia and Georgia State University, my direct exposure to teaching swathes of students with radically disparate academic, economic, cultural, political, and religious backgrounds makes me unique. Given that adjuncts have such a high percentage of contact with students, one might assume that they would be financially rewarded for this… but they are not. Alas, another drawback to being a temporary teacher (which is probably a more accurate title for what we adjuncts do these days) is that one has little time and few resources to develop one’s own research or even read up on the contemporary research being done in the field. While attempting to supplement my knowledge on various developments in this field, I have been lucky enough to gain some reading partners who have been gracious enough to read and discuss with me their research. I go to conferences (which I do not get reimbursed for), I check out books from the school library (although I have to get a letter from my department every single semester to do so), I spend my spare time writing blogs about religion and teaching. I have taught 52 college courses in 10 years. I love what I do. In fact, I think it is rare to find adjuncts who don’t like teaching… because that pleasure is one of the few benefits we enjoy. Only those who love it stay… those who don’t or who have financial sense walk away. So, make a final calculation… low pay, temporary positions, no benefits, no resources, often no office space or it is a closet shared with five graduate students, and limited time to research (which is one of the few ways to advance). So, why don’t we boycott? Why don’t we unionize? Reenact Norma Rae in front of the University Center? This entry was posted in Kate Daley-Bailey and tagged adjunct, Alcoholics Anonymous, Continental Rationalism, Georgia State University, Norma Rae, University of Georgia, US History, Wittgenstein, world religions. Bookmark the permalink. Fantastic article. I am so glad you are informing people about this. Brilliant, Kate. You are so “right on,” as usual about this issue. It’s thorny for the academy. And, since adjuncts are relatively cheap, we are not going to think about it a lot. The first paragraph…the first line…utilizing such words as “unenthusiastic response”, “cliche” and “inductee” is completely off, and quite insulting. If you are comparing the life saving step of having the courage to face down a deathly disease, (and the very warm enthusiastic welcome that such courageous downtrodden folks receive from the loving supportive environment of AA) with whatever drivel you continue on with in your blaaahg…you’ve got it dead wrong. As a graduate of seminary I took pastoral care classes that attempted to draw down misconceived generalizations (and the ensuing insulting language), about those many who are among us…living with strength and conviction in recovery. You can keep your lamentations about your particular “A” away from comparing out with generalized mis-assumptions about the joy and freedom that other “A’s” experience. Kate–insightful and needed comments that reflect not only wisdom and experience but also a personality and dedication that makes your students very fortunate. Keep writing! Thank you all for reading this and for showing support! Dr. Medine… you are right, this issue is a thorny in the academy. I love the academy but just like every system it has its problems. Thank you for looking out for those caught in precarious situations. Mrs. Terry Frost… as an educator and a kindred spirit, I knew you would understand. I want you to know that I think about what you and Mr. Frost did for me all the time. The work that Mr. Frost did on my family’s case changed my life. I was able to graduate with an MA with no student loans (something very few students can say) because of that work. And I often think back to the time I lived with your family and how kind you all were to me. 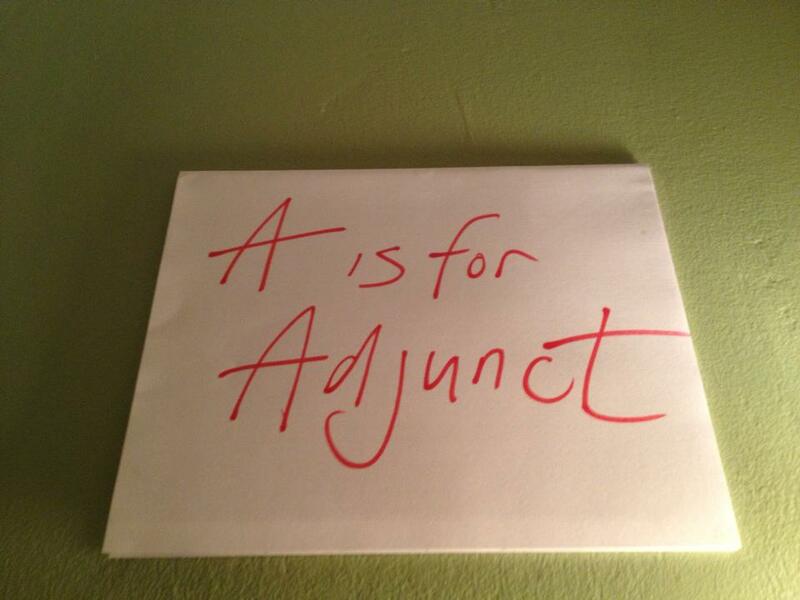 Pingback: A is for Adjunc… | Adventures in Adjuncting! Pingback: Letter to the American Academy of Religion | Adventures in Adjuncting! Pingback: Permission to obtain records from the Board of Regents | Adventures in Adjuncting!